Anti Power kills not only the Opponent's spin, but also its Power! Plus ensure counter attacking! The rubber, which neutralizes the spin thanks to the low friction and the moderating qualities of the outer rubber. ANTI POWER is best used by offensive combi players, since the sponge is fast and of highest quality. 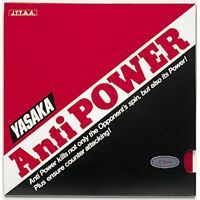 ANTI POWER goes well together with a spin rubber (VISCO or DO-UP for example). 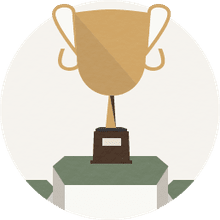 Firstly, the feel of the rubber when you hit the ball is very close to that of a standard European style rubber - so it won't feel too strange when you hit the ball. The racket angle you will need to use is different to normal rubber of course, and is fairly similar to that of normal grippy long pips. Because of the soft topsheet, you can actually brush the ball just as you would when looping or chopping, and the ball will still maintain it's expected arc - it won't just slide completely off the rubber as it would with slippery antispin rubbers. This is very nifty, since you can make it obvious that you are brushing the ball, and the ball will fly off at the correct angle, but without any spin of your own added to the ball - making deception a lot easier. Secondly, you'll notice that the rubber is definitely not a slow anti - despite the name. The fast sponge that Yasaka uses gives the rubber a bit of oomph. So if you're hoping for a antispin that allows you to stick your bat out and gently drop the ball over the net, you're out of luck. This antispin is made for aggressively hitting the ball in a motion similar to your normal topspin style stroke, and then throwing your opponent off because the pace is a little slower that he would expect from your stroke, and the spin is completely different. Thirdly, while Anti Power does allow you to brush the ball when looping or chopping, it doesn't really allow you to change the spin all that much. You'll be able to increase or decrease the spin a fraction, but the low friction topsheet makes it very hard to kill the spin. I believe what Yasaka means when they claim the rubber neutralizes spin is that it more or less neutralizes the effect the spin has on you, not that it kills the spin.